University of Pune, the Authorised Nodal Agency of Government of Maharashtra for SET, Accredited by University Grants Commission (UGC) going to organize 30th Maharashtra State Eligibility Test (MSET) on 1st December, 2013 (01/12/2013) for Lectureship Jobs in the State. 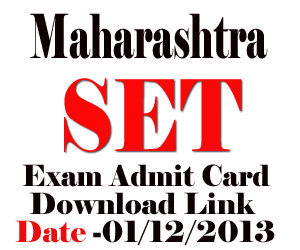 MSET Written Examination venues are Mumbai, Pune, Kolhapur, Nasik, Jalgaon, Aurangabad, Nanded, Amravati, Nagpur, Solapur, Chandrapur, Gadchiroli, Panaji (Goa), Ahmednagar, and Dhule Centers. Those candidates who already applied for Maharashtra SET examination, can download their Examination Admit Card/ Call Letters/Hall Ticket on below given advertisement link. The Syllabus of Maharashtra State Eligibility Test (MSET), Previous Years Question Papers, Results, model/Sample questions all are available on MSET official web portal. We wish you best of luck !